I think I have a problem. My problem is I love planes. I have more planes than one person needs. In fact, I've recently bought a pair of #4 smoothing planes when I already have a great one in my tool chest. Oh, no! What am I going to do?!!! I'll tell you what I'm going to do: I'm going to compare and contrast them over a series of blog posts. Here's my current go-to user. A Stanley type 11. Or maybe a type 12. First up is a plane I got in a batch several years ago. I was very excited by it, as I've never had a type 11 Stanley before. Since I had never rehabbed a plane up to this point, I thought I'd practice and rehabbed a Sargent 409 (Sargent's version of a #4). 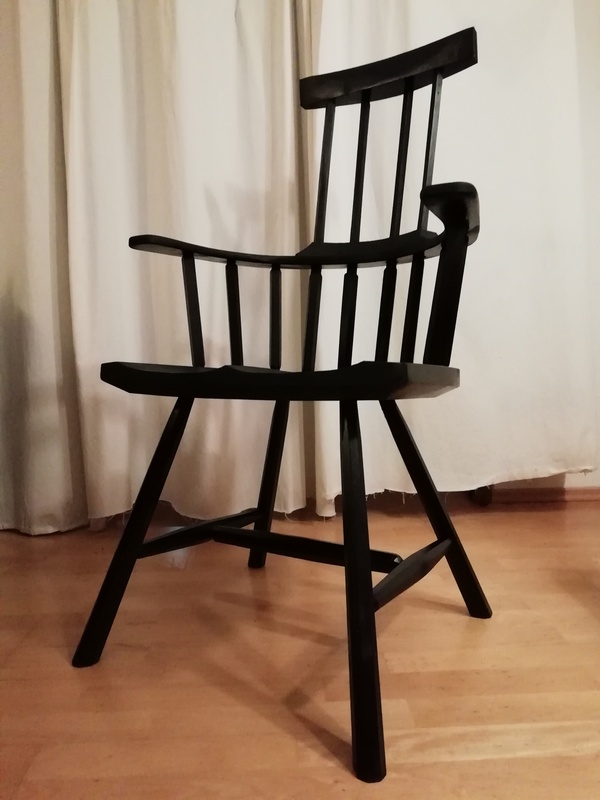 It turns out that the Sargent worked a million times better than I ever thought it could, and I used it for a long time and the Stanley sat waiting. I brought the Sargent to Spain with me, but a couple years ago I took it back to Germany and swapped it out with the Stanley. I did a very mild rehab to it. I don't normally go crazy shining up and polishing planes, unless there is a problem. This one cleaned up very nice, and I've been using it ever since. How do I know it's the coveted type 11? Type 11s and 12s have three patent dates cast into the body. Normally a type 11 has a small one inch diameter adjuster wheel, and the type 12 has a larger one. Mine has the larger one. A type 12? However I'm also led to believe that a type 11 has a low front knob and the type 12 has the high knob. Mine has a low knob. Stanley sometimes used up old parts on new designs of the plane before completely switching over. It's also possible that parts of this plane didn't leave the factory together, but were cobbled together at a later date. Whatever happened, I'm happy with the plane. I think it is a type 12, though. Look at the glorious frog! One reason that many people love Stanleys of this vintage is because these older planes have a smooth frog. Later, Stanley and other plane makers have routed out some of the metal on the face of the frog. I think they must have done this to make it easier (and cheaper) to flatten the frog, and keeping metal where they thought it was needed. All I know is that this plane works well for me. Strangely, the only place this plane says "Stanley" is on the blade, which I have swapped out. I once thought that upgrading the blade and chipbreaker on a bench plane was pretty much necessary to get it to work nice. I don't believe that anymore. I will upgrade if the blade and/or the chipbreaker are in bad enough shape that spending money on new ones is less pain than rehabbing the old ones. Old blades like the one that came out of this plane have awesome steel that is easy to sharpen and stays sharp. In the other hand, I'm not such a big fan of chipbreakers from this era. They seem to be easily bent, and most of them I see (listen to me trying to sound like an expert!) have something wrong with them, and they don't lay perfectly flat across the blade. I often will upgrade the chipbreaker on an old plane. If I can, I'll add it to the original blade. My favorite chipbreaker is the Veritas one, because it seems to be a little more affordable than most of the other premium chipbreakers. I think if you really want to upgrade something on your benchplane, before buying a new blade try adding a new chipbreaker first. You might find that's all it takes. In this case, the original blade was pitted and in bad shape. I looked for a replacement, and found that Ray Iles makes one. I ordered his regular blade for this plane, but I've seen that he also makes one that is the original thickness. I haven't seen any of the premium blade makers make one in the original thickness. I think it would be great if they did. My after market blade and chip-breaker. One thing I love about this Ray Iles blade is the face is hollowed out a little, so lapping it is a snap. Only the very front of the face of the iron gets polished on my stones. The steel is very good and it takes a very fine edge. Money well spent if you are more interested in using your plane rather than collecting them as an investment. Someday I'll have to fix this. The only thing that I really don't like on this plane is the rear tote. I think someone over the years replaced the original tote with a home-made one. Besides being a little bit funny in shape, it is cracked at the base. I've been meaning to make a new tote for it one of these days, but in the meantime I've just been using the snot out of it. I suppose this makes it a #4C, as it has corrugations on the bottom. The sole is corrugated. I haven't really figured out what the benefit is of this, other than if one wanted to lap the sole there is a lot less material there so that job should go faster. But, how often does one need to do that? I find they get in the way when you're trying to run the plane on the edge to make a chamfer. To do that you really have to skew the plane or the edge of the wood falls into the grooves. I honestly love this plane. As a smoother, it works like a monster. I really like the larger adjusting knob. With a fresh stropping and the chipbreaker set very close to the edge, it can take an extremely fine shaving. Why on earth would anyone buy another smoothing plane when one has this one? Well, I thought it would be fun to test them out against each other. It can be difficult to find a plane like this. Can other planes perform as well? Let's test some and use this wonderful plane as a control. Next: my new Stanley "Made in England" #4. "Why on earth would anyone buy another smoothing plane when one has this one?" I have a 604.5 Bedrock with Hock blade and breaker and elephant ivory knob and tote (ok... it's holly, not ivory). It's an amazing smoothing plane (although the blade does need sharpening right now). Why would I ever consider buying another? Haha! Great, Ethan! Is he making one for you from bog oak? I agree, Jeremy. All in all, I think old tools are still vastly under priced for what they do. Supporting modern makers is a great way to keep advancing tool making. Nice blog post! Is the Sargent you are talking about the one I borrowed? Funnily enough I gave it another go last night to smooth some birch chair legs and man, does it leave a smooth surface. I waited to use it for a long time, to give my Veritas smoother the attention it deserved. But I think I am convinced since my experience last night! Why, yes indeed. It is the very same. I had a feeling you'd come around with that one. There are certain things that bevel up planes excel at. They can do a better job at endgrain planing, for example. But, for smoothing I think that it is tough to beat a plane with a well-set chipbreaker. That is, assuming everything is sharp. Funnily enough, the Sargent has just a regular 45 degree bed, so it isn't a high angle plane. Every once in a while I'll put a ten degree back bevel on a bench plane to get a 55 degree cutting angle, but rarely. A BU smoother is a little different. It has a 12.5 degree bed, and you have to add that to the angle of your blade to get your cutting angle. 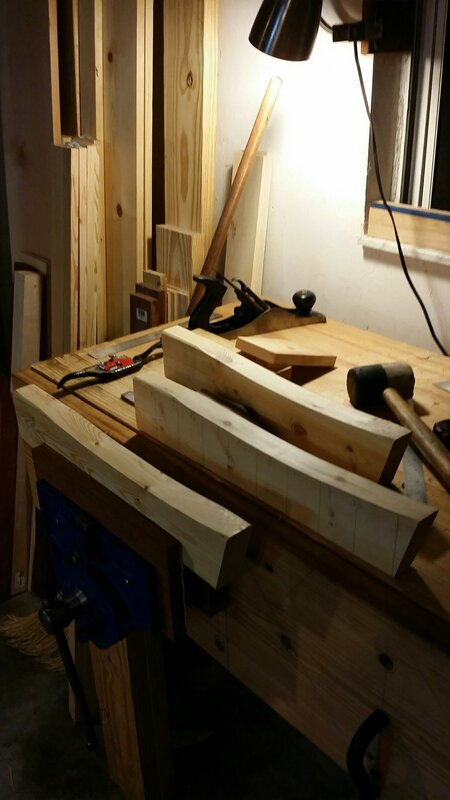 I usually hone my BU jointer at 35 degrees, so that makes it about the same as a bench plane. Looking forward to the comparison of the #4's. As a recovering toolaholic I understand the draw. Haha! We all fall off the wagon every once in a while. Thanks, Ken!